Special discount for Brief Therapy Conference Attendees! Buy the full set of our Collected Works of Milton H. Erickson series in hard cover for 40% off. 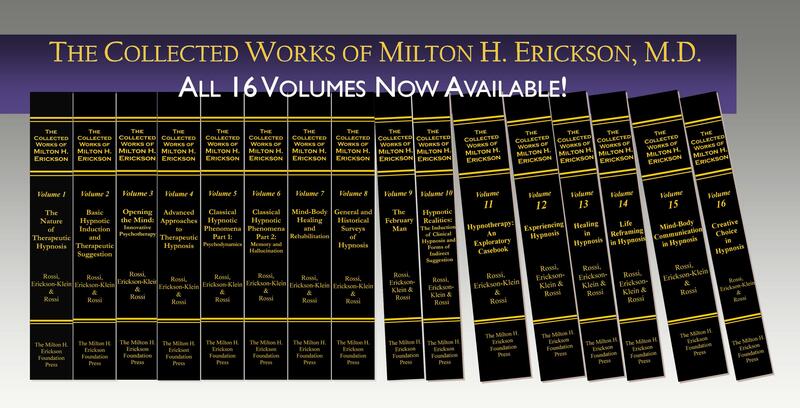 The Collected Works series represents a major and ongoing commitment to gather and assemble the wealth of material created by Dr. Erickson during five decades of work. Beyond preserving this great pioneer's legacy, the purpose of the series is to make his knowledge, insight, techniques, and discoveries accessible to students, researchers, clinicians and educators in the behavioral and health sciences, including neuroscience. This is a limited time offer good only until the end of the year. Click here to access the bundle discount on our online store.